Doing 2 challenges at the same time. 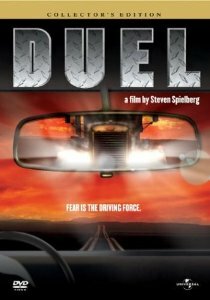 Duel movie by Steven Spielberg continues that directors challenge and this will be my 2nd movie for the 730 movies in a year challenge. Duel is about businessman David Mann who is driving through the desert and hills of California. On his way to a meeting with a client he comes across an old tanker truck who is going slow. David decides to pass the slow truck, big mistake. The truck driver takes it personal and chases David through the highway. The trucker tries to hurt and actually kill David. First time watching it and i’m a fan, the movie kept my interest the whole way although it does get a bit slow at parts but that’s just because the type of movie. Throughout the whole movie I was wondering what was the truckers next move not leaving David in peace. If you are from SoCal and know the desert hills you will know the location where this movie was filmed. Awesome work for Mr. Spielberg’s first TV movie. I will change my rating to out of 10, in this case I give this movie a 7 out of 10.